Premium Italian accessory manufacturer Rizoma has racked up another first with the introduction of a new aspheric mirror as part of its extensive 2013 range. Designed to fit almost all modern naked roadsters and adventure tourers, the 4D mirror combines style and safety, increasing the riders peripheral vision as well as enhancing the look of the motorcycle, The 4D mirrors feature slightly convex glass with a marked area on the outer edge of the mirror, similar to that found in many modern cars, with increased curvature to give the rider a wider angle of rearward vision than with a traditional flat glass design. The mirrors also feature a wide range of adjustment at both the top and bottom of the stem which combined with the large surface area, ensures that the rider is able to achieve a setting optimised for their own preferences and riding position. As you would expect from a Rizoma product, the 4D mirror is beautifully crafted from CNC machined billet aluminium and comes with the choice of satin a black or polished silver finish. 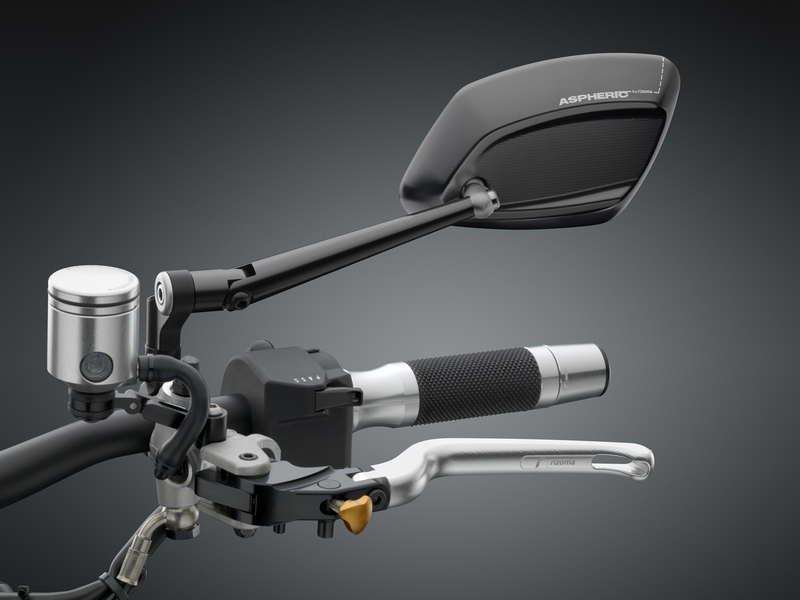 Adaptors are available to enable fitment to a wide range of motorcycles and the product has been developed in line with European homologation standards. The 4D mirror is available from Rizoma dealers now, priced at £109 each.